Escape Cville. Rome, Part 2. It’s January, and the weather can’t decide to be winter or spring. Fierce winds one day followed by balmy, wet breezes the next. No matter. My head and heart are still in Rome. Still. We returned mid-December, but I can’t stop thinking, longing, dreaming, about it. I’ve written about our first night here. I don’t usually travel-write in this way, with a serious blow-by-blow of where we went, what we ate. But I find Rome so different. I experienced so much, my heart remained so full, that even though I know it’s a failed exercise, I want to capture all of it. On our first full day in the old city we headed east along the Via Cavour to Santa Maria Maggiore, one of five major basilicas in the city. 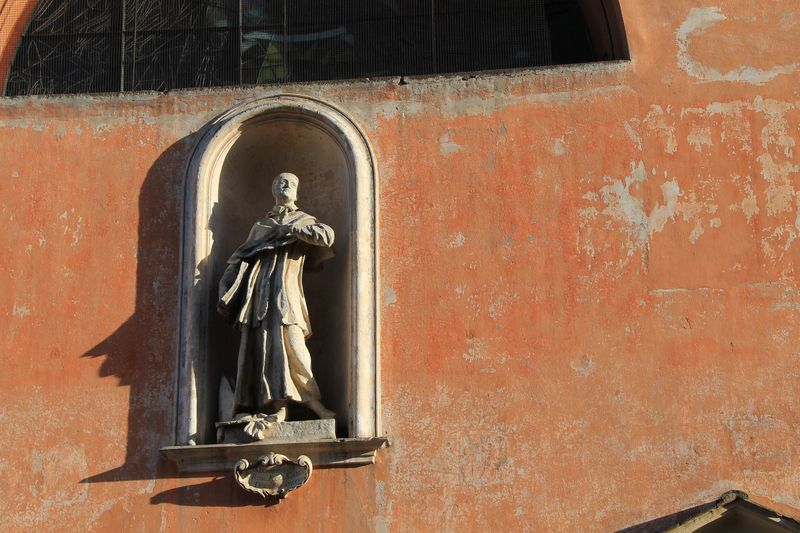 Rome is chock full of churches, one seemingly on every street corner. Old and older, small and big. Churches for every size, type, and inkling. But all Catholic of course. Most are gilded and glorious and Santa Maria was no exception. Noon mass was just starting when we arrived, bells ringing in resonant song across the square. It must have been a special mass* because two long black limousines swept up regally in front, Spanish flags blazing, and deposited what can only be described as Spanish royalty. The men were dressed to the nines, all tuxes and military ribbons and the ladies wore high black lace headdresses. They looked as if they had just stepped from a Velazquez painting. Or a Delacroix. 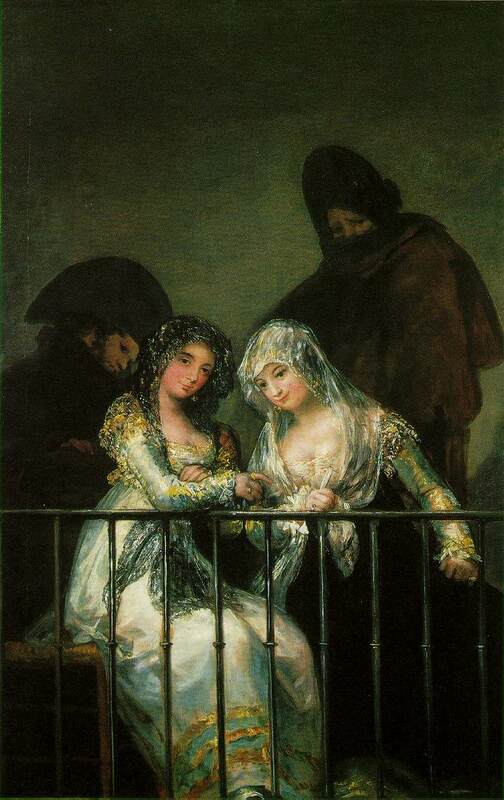 Or a Goya royal portrait. I actually sighed at the sight of them. We stepped inside, our footsteps echoing in the cavernous space, the organ music singing out and the heavy, comforting smells of incense filling our heads. Ancient scents of amber and myrrh that added to the solemnity of the event. These smells, the elaborate gilding, the echoing sounds of footsteps, the gorgeous marble statuary. I was immediately thrown into a spirit of reverence. I’m not even Catholic, but I crossed myself. Then took a seat on a bench to take it all in. The procession of bishops and/or cardinals** walking up the middle aisle with slow, concentrated steps. Ancient nuns, their brown wrinkled faces looking like dried apples murmuring prayers to themselves. The chorus of voices answering the priest in sing-songy Latin. The hymns, which rose to the rafters then drifted back down again like feathers. The old grandmother who entered, so bent over she was almost horizontal. Ten people got up to offer her a seat, but she waved them away. Slowly, with determination, she made her way to a young seated couple. She wanted to inspect their baby, sleeping quietly in her Norwegian mother’s arms. Like us, they had stopped in to hear the mass. The grandmother cupped the child’s chin in her hand and praised her beauty in lyrical Italian while the mother nodded and smiled. I don’t feel the presence of God often. Just in small moments throughout my life. I did then. After a lovely lunch, we visited the Colosseum, then attempted to enter the Roman Forum, a massive outdoor park slash group of ruins just at the top of the Via Sacra. Unfortunately, between our tired legs and bad sense of direction all we ended up doing was wandering aimlessly around the entire perimeter. Looking like sad children at the display of candy we couldn’t get. The Forum itself is surrounded by a high fence, with only two entrances – both of which were at the opposite end. No bother. As we wandered down the Via di San Bonaventura Rome’s magic found us once again. Down a cobblestone street lined with trees whose leaves were dancing down to earth in the gentle breeze sat a man playing classical guitar. The street was narrow and long, the acoustics exquisite. We were serenaded the entire length and once again I felt like I’d been dropped into the Roman version of “Midnight in Paris”. Not only that but a tiny church lay at the end of the via, its walls washed in golden orange, the perfect color of a Tuscan kitchen. In the setting sun its brilliance was like a painting. Paired with the guitar music, it was almost too much romance for me to take. Almost. That evening’s dinner was the topper. Our tired tootsies couldn’t venture far, so on the concierge’s recommendation we tried Mario’s right next to our hotel. To our delight, the night was warm enough for al fresco. In December. An appetizer of Bresaola and arugula drizzled in olive oil. The bitterness of the greens and the comforting meatiness of the beef and oil paired perfectly with the house red and rustic bread. Then a pasta course of housemade tagliatelle with artichokes and tomatoes. SO simple, and yet the sauce was BEYOND complex in its flavors. One of those dishes that looks like nothing and tastes like everything. Dessert? Tiramisu because I hadn’t gotten enough of it yet. It was wonderful. To end? A caffé corretto, espresso with grappa poured in. Lord I love this, but never have it because I suffer from insomnia and espresso doesn’t help. But the warm feeling in your heart you get from the grappa and the bitter coffee tang of the espresso are just so damn good together. Imagine an extra-lethal Irish Coffee. If you’ve never tried this combination you’re missing out. And so ends Part 2 of our Roman saga. By writing it down I’m reliving it with all my senses. Now if I could just find a way to live there. . . Tiny chapels, tiny cars, tiny scooters. The tall trees that lined every avenue. Spindly, crooked, with all the greenery at the very top that lay flat like a table rock. I still don’t know what kind they are. The smell of the churches, ancient like myrrh, amber and frankincense. I wore Santa Maria Novella’s Frangipane perfume the entire time I was there, just so I could smell like the churches. The nativity scene in the tiny chapel next to our hotel. It had a tiny bakery, with a motorized baker putting bread into an oven. Over and over. Doll bread. The ancient eyes of the stray cats we saw everywhere. **My knowledge of Catholic religion is sorely lacking but the clothes these guys had on were red, while some wore purple. Just stunning church couture. That coupled with the gorgeous smells and gold? Hell, I’d convert just for the pageantry!